Ecommerce Shipping & Fulfillment - CTRL+CLICK CAST - We inspect the web for you! Your browser doesn't support HTML5 audio, and won't play Ecommerce Shipping & Fulfillment with Noah Bernsohn & Peter Compernolle. You can download this episode to play on your preferred media device, or you can read our transcript. It’s simple: Ecommerce development is complicated. There are a lot of moving parts, from understanding business rules and tribal knowledge to designing for user experience and building internal systems that work. We tackle all of these points with Noah Bersohn and Peter Compernolle, with a focus on shipping and fulfillment. Noah and Peter share two client case studies, each with unique shipping and fulfillment needs. They detail their approach, which starts with a strong focus on discovery and proceeds quickly to prototyping for validation before diving into full-scale development. They also discuss the ecommerce frameworks and CMSs they use (and prefer), and how to strategically decide when to move from out-of-the-box to plugins or custom dev. Emily Lewis: We have talked a lot about ecommerce on this podcast, but mostly from an introductory perspective for different CMSs. Today we’re going to take a deeper dive into ecommerce focusing on shipping and fulfillment. To guide us on this discussion are Noah Bernsohn and Compernolle from One Design Company. Noah has spent the last eight years building websites and applications for partners ranging from Fortune 20 companies to mom and pop toy stores. A self-taught web developer, he’s helped build One Design into a well-respected, well-run company. Peter is a senior software engineer who builds mobile web applications for One Design Company. With a background in mathematics and computer science, he’s on to solving complex problems using Ruby, PHP and Swift. Welcome to the show, gentlemen! Noah Bernsohn: Hey, thanks for having us. Peter Compernolle: Thank you very much. Lea Alcantara: So can you tell our listeners a bit more about yourself? Noah, let’s start with you. Noah Bernsohn: [Laughs] Yeah, so sort of the background working in Ruby and some PHP and things like that, and I also focused a lot on operations at One Design right now. Lea Alcantara: Very cool. So, how about you, Peter? I saw from your bio you shared with us that you’re fluent in Mandarin. Peter Compernolle: Fluent is a subjective term I suppose. Peter Compernolle: But yeah, I’ve been able to speak Chinese for a couple of years. I lived there for about five. Peter Compernolle: I’m going back there on Sunday actually. Emily Lewis: For pleasure or business or family? Peter Compernolle: I’m going to pick up my mother-in-law and bring her back to the States for her first trip over here. Lea Alcantara: Oh, exciting. That’s fun. Peter Compernolle: Yeah, yeah, it should be a good time, and I’ll be there for a week. I get to eat lots of good food and good drink and then come back. Emily Lewis: Yeah, Lea just came back from that part of the world. Lea Alcantara: Well, Japan, China. Lea Alcantara: That’s the kind of… yeah. Lea Alcantara: Yeah, my sister is, well, I wouldn’t consider her fluent in Mandarin, but she lived in Beijing for a year, and she’s conversational in Mandarin so I often joke that she’s my Chinese sister. Emily Lewis: It’s a beautiful language. I love the way it sounds. All right, well, let’s actually get to today’s show. Before we get into the topic though, let’s first talk about the types of ecommerce projects you guys have worked on, the types of client needs you’ve solved, and also what types of content management systems you’ve worked with. Noah Bernsohn: Yeah, for sure. So over the years, we’ve done a lot of different types of ecommerce. Some of it like Field Notes, which we launched this past year. It’s sort of a traditional where we’re selling things online that are shipped. Some of it is a little bit less traditional. We built an app for a local restaurant group here where you can order things and you order on your phone, you walk into the story and we used beacons to detect where you are and fire the order into the kitchen. Noah Bernsohn: So it’s still technically ecommerce, but a really different application of it, so it’s really interesting sorts of problems to solve for us, and we’ve used a lot of different types of frameworks to do that. Some things are really custom, the app for Eastman [Egg Company] is a mobile app so that’s all native, and then on the web, it’s Rails on the back-end, so Ruby and, yeah, there’s a custom API there while Field Notes is built on Craft, which is an ecommerce platform that I know or a CMS that I know you’ve talked about previously, and we worked a lot with Craft. Noah Bernsohn: But we really like Craft. It’s really nice. I would say both from our perspective from building and designing whatever we want, and then our clients across the board love it. Just the ease of use is great. We can really build a powerful content management solution for their marketing or content teams and they can just do stuff that other CMSs haven’t been enabled them to do, so that’s been our choice and we work with their commerce package this year to build Field Notes and that was great too. It’s really a pretty solid solution that let us sort of build the things we wanted to build in the way we are familiar with Craft. In terms of ecommerce frameworks specifically, we’ve worked with Shopify in the past, which is of course a hosted solution, but has some great things going for it, and Spree which is a Rails-based ecommerce thing, which I think have taken over by the Bonobos team and some other folks. It seems to be going in a good direction, and then we have custom stuff as well. Emily Lewis: So with this wide array of frameworks and systems that you’ve worked with, how do you make the decision on what to build for a given client? I heard you say you were doing a whole lot of Craft work right now. Do you go into every projects kind of knowing Craft will be the underlying system? Peter Compernolle: Absolutely not, big amount of time for all of our projects is invested in the beginning to try to figure out what the client needs specifically. So usually we spend about two full days with the client to try to understand what their needs are, what’s special about their needs. So ecommerce, in general, is a pretty broad idea. You sell something using the internet usually and then deliver it somehow, but the two examples Noah just mentioned are completely different. Peter Compernolle: They still fit that paradigm, but one is using mobile application where the real nugget of what makes it special is location awareness, whereas the Field Notes website, they’re kind of special. A lot of the content on their website is talking about how people use their product rather than the product itself. Peter Compernolle: So we opted for Craft for that because they manage all of this content themselves. Peter Compernolle: So we usually try to figure that out early on, but it’s different for every project. Noah Bernsohn: Yeah, I would say the other part of that is we do focus a lot, as Peter was saying, on that early discovery process. Noah Bernsohn: And then we try and figure out what we can build quickly to validate a given solution, so we sort of stack up what our assumptions are, what our major project risks are, and then the first phase of any given project is typically a sprint to sort of eliminate as many of those risks and validate a given a solution as quickly as possible. So in a case like Eastman, we knew the risk were how do we integrate with the point-of-sale solution in a restaurant and would people actually use this thing, and would we be able to accurately identify when someone entered the region, and so we built a prototype I think in a couple of weeks for a mobile app that allowed you place a coffee. Noah Bernsohn: You can press the button and you’ve got a coffee. Peter Compernolle: So for the first couple of weeks, we identified the easiest way to answer those questions was to ignore the fact that people can eventually customize their orders. A big technical risk was here in Chicago in the Loop. There are lots of glass and steel buildings which makes GPS less accurate. Peter Compernolle: So we wanted to test the app while also testing the ability to send orders to their point of sale, so we, through force, created an order with nothing but one cup of coffee, no modifications or anything, already paid for, and that way when you entered this area, it would automatically just send that standard order, and slowly we add more features as we discovered that this is the right choice and this is the right solution for the problem. Emily Lewis: And if you guys have discovered that this wasn’t the right solution, like it didn’t address that core functionality you had questions about, would you just have shifted immediately to another platform and do you bill that into your project budget? Noah Bernsohn: Well, for this particular project, everything was custom, so we mostly just needed to know what’s possible, what would degrade the user experience so much that we have to rethink things, and so the client we were working with was very understanding of how software evolves, and we gave them fair estimates to say, “We think this will take about a week or so, or whatever, to figure out how to do this, but if we found any problems, we could pivot from that.” And so it was very much a living product almost immediately. Emily Lewis: Yeah. And it sounds like you got the buy in from a client early on for that. Noah Bernsohn: Absolutely, which was critical for that project. Noah Bernsohn: It’s sort of a mix where we’ll look at the bigger picture and give them some sort of range. Noah Bernsohn: So we know like if we’re in this range, this is going to work out. It sort of depends on the client too because one of the difficult things I think in this business is that if you come to us and you want to build an ecommerce website and you have a budget of a 100K or a 500K, we can potentially build a solution for you. It’s just really figuring out what’s the right solution for your business and what’s the right investment for you. Noah Bernsohn: So it’s sort of tricky, but we do often start engagements with that discovery phase, and it’s typically a one-week or a two-week sort of sprint where we have a dedicated team on there working really closely with the client sort of ideating and then trying to solve some of these problems, and we look at what are original high-level estimate was and try to narrow that down and make some hard decisions there with them about like what’s a good first real release for this thing and what’s the sort of next phase of work. Noah Bernsohn: But the other nice thing about this process, we think, is it gives everyone a chance to work together and sort of just start developing a relationship. Noah Bernsohn: Because I would say the biggest sort of difference between our projects that are like super, super successful and the ones that are just good projects is that relationship where we have a lot of trust between the teams and people can be really open and honest and have the conversations that you have to have to launch products like this because regardless of what you’re doing, there’s going to be tradeoffs and it would be tough if you can’t have those conversations in a way whenever it feels like they’re on the same team. Emily Lewis: Yeah. I didn’t really expect to talk about this, but I do love this part of our conversation because it’s almost a beautiful summary of the past episodes we’ve had this summer because we had Mitchell Kimbrough from Solspace on and he talked about this idea that in his discovery process for like a third-party integration, he builds a CRUD script to essentially test and validate if the core functionality is possible. So you’re sort of saying the same thing, it’s not a CRUD script that you would necessarily throw away or anything, but it does sort of validates, but also you’re testing to see if this functionality is possible, so you’re moving forward with proven data, which is the episode we had, Lea, with Matthew [Oliphant] on data-driven design. Emily Lewis: And then there’s discovery, this engagement thing we talked with J. Cornelius at Nine Labs about the importance of discovery only and especially for this client relationship thing that you’re talking about, and I think it’s really nice to hear how people are approaching discovery because it can be assumed to be one thing, but I feel like we have an assumption about discovery being like you’re just gathering information. Emily Lewis: But between what Mitchell was telling us about APIs and what you’re saying, discovery could also involve like some prototyping, some development to actually validate your assumptions, so I really love that idea. Noah Bernsohn: That’s exactly right. So a big part of it, when I first came to ODC, I thought the inception was mostly, like, you said, to gather information, but after lots of successful discovery phases of these projects, I discovered it was much more understanding process. For example, the more we get to know a client, the more we can answer questions sort of in their place. Noah Bernsohn: So time is finite, so if we only have a week to do either feature A or feature B, that’s pretty clear, we can ask the client which is more important to them, but building software has thousands of these small decisions. Noah Bernsohn: And so the better we can answer the question for them, the better the product will be, and likewise, the client has an opportunity to see, “Oh, wow, there really are a thousand decisions that you need to make, so what’s important for me to share about our priorities and what’s important to us.” You know? Peter Compernolle: Yeah, I would say that’s really important too, and it’s again one of those factors in what a successful project looks like. It’s having someone, like a partner, who wants to feel like they’re enabling us to make decisions as if we’re a member of their team and sort of outside order taking process is one that we haven’t found to be as successful. So people who want to spend the time to understand what happens every day and what the sort of minutiae, to a degree, are the types of people we really like to work with and have produced some cool stuff with. Emily Lewis: Well, I love that little turn that this discussion has taken. Let’s talk about the main topic for today though, and I think it would be good to define what fulfillment and shipping is to start, and just a side note for our listeners, we will link to our ecommerce archive in the show notes and so if you want to get a more intro level look at Craft or ecommerce with ExpressionEngine or Statamic, we’ve got episodes on all about that we’ll link to. But for now, let’s go ahead and define these terms. What is fulfillment? What does that encompass? Noah Bernsohn: Fulfillment can take lots of forms. Typically with ecommerce, you’d think of websites where you select products, maybe you customize them, you make a payment, and then fulfillment is everything that happens after you push go, so the store is notified of what product you’ve purchased, shipping address and things like that, and then someone somewhere, whether it’s in a warehouse or the back of an office, throws it into a box and then ships it. But as we mentioned earlier, ecommerce takes lots of forms, so fulfillment for the restaurant that we worked with was actually creating a sandwich, throwing it into a bag, and then putting it someplace for you to come pick up. So really, I like to think of fulfillment as everything that happens after the front-end ecommerce experience. Emily Lewis: Okay. And then how about shipping? It sounds simple, most people know the definition of that word, but I know from experience it is complex. Can you explain what shipping is at its most basic? Noah Bernsohn: So shipping generally is the step after that. So if you think of the life cycle of purchasing something, you would select it, you pay for it, the store is notified that you’ve made a purchase, the store prepares that for delivery and then gives it to a company like UPS, USPS, FedEx who delivers it to your door. Again, it changes based on the business model and the product, but really shipping is everything that happens after it leaves the store. Lea Alcantara: So let’s talk about the nuances then, so that’s the basic. What else can shipping encompass for something a little bit more complicated? Noah Bernsohn: Yeah. And they can go there too, but it’s the idea being that shipping does take a lot of different forms, and it is one of those things also that gets complicated when you think about ecommerce because of the options available to someone and there are a lot of factors at play once you start calculating something like how much does this cost. You have to understand from the end users’ perspective or the business’ perspective what it’s going to cost them, which can change radically. Peter Compernolle: And that’s one thing that Amazon, I feel, almost has done a disservice for everybody else. Amazon Prime has made it so inexpensive and so fast to delivery anything. My wife and I are expecting a baby soon and we’ve spent gobs of money through Amazon and it’s still two days later to buy a huge heavy crib two days later that shows up on our doorstep, and I feel like for companies that don’t have that size or aren’t willing to sacrifice their profits for market, I almost feel like it has done a disservice. People don’t understand the cost of delivery anymore. Emily Lewis: Yeah, it has completely skewed consumer’s expectations. Peter Compernolle: Absolutely. I mean, I have strong opinions about this, but I feel Uber has done that as well. They take lots of funding, they subsidize their drivers; therefore, your rides are much cheaper, so already we’re kind of losing the sense of knowing what it cost to get from place to place. In the case of Uber, it’s a human sitting in a car. In the case of delivery through Amazon or something, it’s a product, but the same idea. Lea Alcantara: So do you have those types of conversations with your clients, with your ecommerce clients, when you start discussing the shipping options for their online store? Noah Bernsohn: We sometimes do. Typically the business that we’re working with already has a lot of it figured out, so we work with them to figure out kind of the user experience, which options we emphasize. For example, Field Notes has quite a loyal following here in Chicago, so one of the options is to come pick it up in their office, which is fun. Noah Bernsohn: And so we need to understand that and kind of what it means to them. Peter Compernolle: Yeah, I would say that probably the biggest part is really diving into how the business operates to make sure we’re building something that does it as well or better than they already do, so we’re not creating a new process for the sake of creating a new process, so with Field Notes, we had to understand what all of the permutations were with shipping where if you pick it up, that’s one option. Obviously, it’s free to come and pick something up. If you order a certain amount, that’s going to be free. If you want next-day shipping, that’s an option. They also have wholesale customers, so if you are a retailer, you can sign up for an account with them and you have to have tax ID and all sort of fun stuff, but that changes the way that you ship also because if you’re shipping a pallet of books, you’re not the same thing as a person getting one to three packs of notebooks and so you need a different set of options, potentially a different payment method either where you get invoiced for something like that. Noah Bernsohn: Yeah. So for us, a lot of that is just understanding what situation that is appropriate. So one thing, when people come to us, they usually have these ideas. If they take phone orders, they can very easily understand, “Oh, you fit this category, therefore, these are the options most appropriate to you,” and converting that to something a computer understands is can be challenging. So again, to use Field Notes as an example, there are a few dozen shipping options, if you look at it at its deepest level, but we don’t want to show all dozens of those options. Noah Bernsohn: So we need to understand using this logic, you should see these four options or five or something like that. Emily Lewis: So how do you get to that? So what are the questions or the exercises or the scenarios you go through with the client to understand not only what the various, let’s say, twelve shipping options are, but who the users are that see the different scenarios? What does the process look like? Noah Bernsohn: There’s so much understanding that they have about their business that we don’t even know what to ask about, so we can get the really obvious things out of the way and then it’s the little stuff later. For example, to make it an option for in-store pick up, do we want to only show that as available to people in Chicago, so people in Los Angeles don’t think, “Oh, I’m going to drive to the store”? Noah Bernsohn: We don’t want to bother them with that option, but if somebody’s address is in Los Angeles and they happen to be somewhere in the county, maybe they do want to come by. Noah Bernsohn: So that’s where it gets a little fuzzy and we need to work with the client to understand. Peter Compernolle: The first step in that process is typically sort of we build user personas, which I think is a pretty common practice, but it helps us break down the different types of people that are coming to the site. So again, in the cases on like Field Notes, we’re typically talking about a retail customer or a normal consumer, and then through the admin users, there are some other random sort of people, but at least gives us sort of a baseline to start that conversation and begin to understand all different things, but then, yeah, you do run into edge cases all the time, and again, I think it comes back to how you have those conversations with the client in what your process looks like. Peter Compernolle: Because we could start the process by spending a few weeks doing that discovery and building out like use cases. Noah Bernsohn: For Eastman, the restaurant application we talked about, that was even more critical, so a lot of our discovery was understanding different types of customers, and the reason for that is building a mobile application that interacts with a third-party point of sale is more work than customizing a CMS to work the way you need. Emily Lewis: So if this kind of edge cases that reveal themselves through testing and stuff and that’s something that you just go into accepting in discovery, you’re not going to get all of those little details. Is that something you’re also building into your budget to allow for that sort of unexpected, “Oh, we didn’t consider this scenario” or is that being considered? Noah Bernsohn: Absolutely. And part of that, it’s not really like we pad the hour and say, “We think this will take ten hours, but let’s budget for twelve.” It’s much more, “This ongoing process of this edge case came up and we didn’t realize how important it is, therefore, this other thing we kind of hoped would be there, we will do that later and reevaluate.” So a lot of our clients come back to us once or twice a year after we build the initial release, and in the time that we’re not working with them, they can come up with sort of wish list and then we work with them again, we can prioritize things like that. I remember one edge case we were very worried about for the restaurant app was people being in the same building but on a different floor. We were concerned if we use GPS or geofencing or something that’s generally two-dimensional, what happens if somebody is on the 15th floor above the restaurant when they place the order? And that, we were really concerned with and it turned out to be absolutely a non-issue, and part of that was because we decided to use beacons are three-dimensional and broadcast sort of a big sphere around them. But another part of that is because most customers that are using this app are coming from the suburbs or from other parts of the city, not from upstairs. Emily Lewis: So we’ve talked a little bit about how you’re handling these edge cases and you’ve sort of embraced that as part of the development testing process, but for our listeners who may be newer to ecommerce, what are those sort of obvious questions that you do want to ask the client in the beginning about shipping? Noah Bernsohn: About shipping, I think the biggest thing is understanding what situations. For example, product sizes, we can greatly simplify what shipping looks like to the consumer by offering Ground, Express, Next Day or something like that, but maybe a product that we’re selling is too big for one of those options, so that’s a big question we have to understand. These are the options available, are they actually available for every single product? Or is this one obscure product or something that you need to order or custom make and therefore it takes longer? Things like that. So like I kind of mentioned before, it’s easy to think things are very consistent. Noah Bernsohn: And there are only three shipping options or something, but then when you really get into the nitty-gritty, oh, there are many more. We can’t do Next Day Air to some country because that’s not available to us, so we need to find those exceptions as quickly as possible, and then from there, we can sort of architect and design how we determine which options are available. Emily Lewis: How about for fulfillment? What are the kind of questions you’re asking during your discovery phase about that part of the purchase process? Noah Bernsohn: So I mean, I think the most valuable thing that we do here is we go and look at what they’re doing in person, you know? Emily Lewis: Oh, you actually go to their facility. Noah Bernsohn: Yeah, yeah, I mean, conversations are great, but we go and we see how it’s done. So for example, for the restaurant, we went and stood in their kitchen [laughs] and watched them make sandwiches and pour coffee and everything else. We saw how the expo works and saw how the KDSs work, all that sort of stuff, because one of the big goals that we had in building that product was integrating directly into their operations. Noah Bernsohn: A lot of services today, if you use GrubHub or something like that, Caviar or whoever, they’re going to these restaurants and giving them like a tablet or faxing them stuff. Peter Compernolle: I went to a restaurant the other day that had probably eight tablets at the host stand with different services like GrubHub and various. Peter Compernolle: It was nuts. Noah Bernsohn: And so what we did, our solution, it goes directly into the kitchen and for the person making the sandwich, it behaves exactly the same way as anything else, and the person at the front desk doesn’t even know that it’s there because it’s really not something they have to worry about. Peter Compernolle: It was almost so seamless that we had to change the way that we were doing it a little bit because the kitchen didn’t understand it sometimes. If there’s nobody in the restaurant and they started getting orders, it was sort of a foreign idea for them now. Of course, they’re used to it. Peter Compernolle: But we had to change the customer’s name to say the word “app” in front of it. Peter Compernolle: Because it was otherwise so seamless. Noah Bernsohn: Yeah. And for Field Notes, we would go, and their office and their fulfillment area are tied together. They’re actually opening a store in their office too, which is really cool, so they will be announcing that soon, and people will be able to go in there. You can go there now, but they’ll do a bigger thing. But actually, in the back, they have sort of a warehouse area and a bunch of fulfillment loop spot seats I guess, and so yes, seeing how that all work really helped us figure out a good sort of solution there and we did a prototype and test and so for Field Notes, it traditionally operated in a way that a lot of them to get stuff done really well, but wasn’t necessarily making use of the latest and greatest technology so they have sort of custom stuff that they had built years ago and hadn’t really updated as they grew. So their order process was a little difficult where they’d have a packing slip and a shipping thing and they were separate. Noah Bernsohn: And if you’ve worked in a sort of packing area like that, it’s sort of a confusing process to start keeping track of like two pieces of paper. For every order that comes out, they come from different places. Noah Bernsohn: And so it’s just getting to the point where it couldn’t scale to grow and it made everything take longer than it needed to, so finding a great way to make this all happen at once was really important to them. Peter Compernolle: Of course, this is what computers are good for, you know? Peter Compernolle: A lot of businesses start off mechanical turking using the easiest way, why do we need to over-engineer a solution to some small problem, and then over the years it gets bigger and bigger, and it’s easier to just add more person to keep doing that same thing when it’s nice sometimes I think for us as outsiders to the business to come in and see, “Well, now you have four people doing this, we can optimize it in such and such way.” It’s also very important clients will tell us, “This is very important. We need to do this,” and then when we actually see how terrible the alternative is, it goes a lot longer than just a stern statement. Lea Alcantara: So all of this to me, this entire conversation tells me how complex shipping and fulfillment can be. So if we take this back into development, how often do you have to customize things versus rely on out-of-the-box features because we started off talking about something like Craft Commerce and Shopify, which are pre-built and they have their own options, but considering all this nuance, how can you just use out-of-the-box features? Noah Bernsohn: Yeah, that’s a good question, and it really sort of depends on the business on where they’re at. Someone like Field Notes is at a scale where it is so important to customize how things work to their operations, but for a lot of people, I do think that a solution like Shopify or Craft Commerce can get them a lot of the way there, and then there are a lot of great services you can integrate with. So for Field Notes, what we ended up doing was integrating with a service called ShipStation, and that enabled us eventually to get the printing and labels and packing slips printing together, paying for postage, all of that stuff, and what we were mostly building was the integration between commerce and ShipStation, which we made a plugin for anyone who wants to use it, it’s open. But to do that well, we had to evaluate all the options. We built an early prototype to actually start using ShipStation well before the site launched, so we started using ShipStation probably six months before we launched the website, and that was part of the initial prototype, so we built the very first prototype again two weeks to a month, and we looked at all the different solutions that help with fulfillment and shipping and eventually we demoed a few of them with Field Notes and ShipStation was the one that we were able to accomplish what we needed to accomplish with, and then it was just making sure it was really going to work, and to do that they started fulfilling orders using it. Not all of their orders, just their wholesale orders, which is a little bit less of volume, but again, finding the quickest way to determine how you’re going to do this well is sort of important use there. Peter Compernolle: I think regarding your question how much can you get out of the box, how much customization is needed, I think that that question really goes beyond shipping or development of an ecommerce solution. I think I use to run a very small company that sold notebooks and we identified very early on that the complexity of having lots of inventory was something we weren’t willing to undertake, so we simplified everything to the point where we only had I think five products, and I think that that was personally a decision that we made because we didn’t want to build a complicated website, but also because we didn’t want the business to be complicated, and in that case, we were able to make that decision because, I don’t know, our customers were okay with it. So as far as what needs to be custom and what can you get out of the box, I think so much of it depends on how you’re operating your business. So as a software engineer, I need to make decisions like this all the time, “This thing out of the box does 90% of what we need. Is it better for us to adjust to work with that 90% or should we invest time and money and more importantly, I think, complexity in bridging that 10% gap?” And it’s a very difficult thing to evaluate. Complexity is extremely expensive, especially as products change over time. So to answer your question, although more briefly, I think it’s really a difficult business decision to make, which you can get out of the box and which you should customize. Emily Lewis: If we can take a step back to talk a little bit more about the plugin your built for ShipStation, so I’m just curious, whatever Craft was offering in terms of, I guess, inventory management or fulfillment wasn’t enough and so you’ve created this plugin for and does it for the client, the end user, is it just a single process for them or are there extra steps that they have to adjust for or is the integration just completely seamless? Peter Compernolle: The integration is pretty seamless; you have to enter some account information so Craft is able to talk to ShipStation, and then if you aren’t comfortable with writing code, you just stop there and it works as is. We did add some other customization options because clients we’ve worked with had need of them. Peter Compernolle: So ShipStation, for example, allows you to send some other fields and ShipStation doesn’t need to understand what those fields are, but maybe, for example, with Field Notes, they want to know in ShipStation, is this a wholesaler or not a wholesaler? So we’re sending that information as a custom field, and then Craft itself, we use a lot because it’s so configurable and customizable and so our plugin tries to live by that spirit as well, so we try to make it customizable, but not necessarily. Emily Lewis: But did you need to do any sort of customization on the shipping end in terms of when the customer is adding things to their cart? Are you integrated with like dynamic pricing or anything like that, and was that anything that you had to do custom? Noah Bernsohn: Yeah. I think that’s sort of an interesting point because Commerce does handle it. We have to configure the rules and things like that, and so while it’s not technically difficult in terms of like programming work, it’s just complicated business rules that people have to talk out and configure and all that sort of stuff. Peter Compernolle: Where it’s easy when you’re in a business to understand what these rules are, but when you’re translating it into something that a computer understands it, it suddenly becomes very complicated, which products are available in which way, and for example, when I was selling these notebooks, you could choose which paper type you wanted, if you want graph paper, ruled paper, plain or whatever, and so we made it very simple, you pick a notebook and then you pick the paper type, and while we were going through testing, we noticed that some products don’t have all of these paper types, and that’s something that as someone running this business and using these notebooks for most of my life, I had completely taken for granted that it is more complex than that. Emily Lewis: I think that’s actually a nice segue to a question we got from a listener because I think it’s essentially about understanding business rules and working with a client to make decisions about that. So listener Jonathan Melville asked, “I have a client that has pre-negotiated rates with FedEx. What’s the best way to go about calculating their shipping cost in the cart? FedEx’s dim[ensional] weight shipping cost formula seems to make this very hard.” So let’s say you have this scenario, how would you guys go about figuring this out in terms of implementation? Peter Compernolle: So this is actually something that we dealt with. Commerce right out of the box, if we’re talking about that specifically, has lots of configurations, so you can say they have shipping methods which would be at a high level, Ground, Express or Super Express or something, and then within each of those methods, they have a set of things that’s called shipping rules, and a rule, you can define when it’s applicable. You can define the priority, meaning apply this rule first and that rule second, and then you can also define the pricing, so if it’s fixed pricing, you can do that, or if it’s a percent of the product, all of these different things. Peter Compernolle: We ultimately didn’t need to because the rules that were built in were so flexible as it were, but it was something that we definitely looked into. Emily Lewis: So it’s one of your things that you validated early on to see if it even worked? Peter Compernolle: Exactly, exactly, yeah. Peter Compernolle: And then it did get complicated because we started using Commerce when it was a pretty young product, and this we knew going into it and evaluated the risks and it provided so much that other platforms didn’t that we were willing to jump in. For example, you could apply a shipping rule by country so you could say, “If you’re in the United States, this is the rule to use.” But you couldn’t say, “Do this for every country except for this country,” and which meant — it changed since them — but at that time, it meant we either enter 250-some records or we write a custom one, so we wound up writing a custom one to say, I think, for US, Mexico, Canada or something. Yeah, that was something that we were glad to have figured out early on because otherwise it would have been — I won’t say deal breaker — but it would have made our lives much more difficult. Lea Alcantara: So this I feel like leads into one of the things that you mentioned when we first started speaking about you guys joining us on the show. You mentioned there are some finer details a lot of people may not realize with ecommerce in general. Can you tell us like what the top points people should always keep in mind with ecommerce? Peter Compernolle: I have a few. Noah probably has some as well. The thing for me, I’d already said we really greatly value the user experience, and when we build things like this for clients, part of it is out of our control. If that product line is already very complicated, there might not be much we can do. But in general, ecommerce platforms right of the box all provide the same sort of functionality, and everybody’s product line is very different, so it’s sort of strange that that’s the way it works. What I mean is they’ll typically have categories, you can browse by categories and that assumes right away each product category has an equal weight. What if 98% of our products are in one category and then 2% are in these other three categories. Why do I want to browse by category? That seems silly. Peter Compernolle: And so Field Notes, I think, our designer named Collin, he’s not here today, he did an excellent job at identifying the way people would most likely browse or search for product for Field Notes, and that was to put it on one page so it’s sort of — I’m reluctant to use the word “revolutionary,” but it’s this totally different experience from other ecommerce platforms — you land on the home page, which normally says, “Hey, welcome to our website, click here to do stuff,” and instead you scroll down and you see all these beautiful products right there, and then some insights that Field Notes was able to provide was a lot of people read their blog. They call it a “dispatch.” And the dispatch is generally how people in different walks of life use their products, so there was a great one a couple of months ago I enjoyed about a pilot who takes Field Notes with him on every flight, and so people will go and read that just because they’re interested in reading it, and then we need to make sure that people can buy that product as they’re reading it easily. So an out-of-the-box solution, of course, you can sell these products and people understand how that works, you click a product and you click something to modify it or quantity or something like that, but to really make it unique, you have to understand what the product is and what kind of people are coming to check it out. I’m not sure if that answered your question at all, but I think that’s a very important thing to think about with ecommerce, these paradigms have been established for a long time and they don’t always fit. Emily Lewis: I couldn’t agree more. I built a store a couple of years ago and tried to buck some of the conventions I had seen out there because I didn’t care for them as a consumer myself, and I think it’s a good point that ecommerce isn’t just a transaction, it is a user experience, and if you really embrace that and, like you said, understand your clients, customers or audience, you can really create an amazing experience. Peter Compernolle: I agree. The company I had started a few years ago that I briefly mentioned and is dead now, we really enjoyed the sort of the connection between the digital world and the analog one, so we were selling notebooks, which means right away people are using something physical that they can hold and they’re writing notes with a pen rather than a keyboard, and so assuming our customers enjoyed that, we wanted to make sure that the experience on our website was as close to that as possible. Peter Compernolle: So we made it so you could order more notebooks without ever opening up a web browser. With each notebook that we would send, we would include a postcard already stamped and addressed. Emily Lewis: Oh, I love it. Peter Compernolle: And then they could drop it in the mail, and we already have your credit card number and everything so if we get it, we’d send an email to confirm, and there are some boundaries that you have to stay within, but I don’t know, I think that one of the more enjoyable parts of my job in what we get to do is think about this sort of different approaches to a very common problem. Peter Compernolle: I completely agree. I completely agree. Emily Lewis: All right. Well, before we wrap up guys, do you have any final pieces of advice for anyone who’s dealing with shipping, fulfillment or even just ecommerce in general? Peter Compernolle: I suppose the only advice I would have is advice I’ve given in lots of situations, and that’s something we touched on earlier, I would say try to avoid complexity as much as possible. Peter Compernolle: Because something that works when you’re testing, when it scales can quickly become impossibly complicated. Peter Compernolle: And that’s something that’s hard to communicate, even the idea of something being complex is hard to identify, but there is great value using something like an ecommerce platform right out of the box. Maybe customize the experience, but the more plugins you need to use, the more you’re straying from this out-of-the-box experience, so if that evolves with security patches or new features or something, you’re responsible for adopting everything else you’re using. I generally give this advice anytime I build any kind of software. Peter Compernolle: So I feel like a broken record in a way. Peter Compernolle: But I think that’s important. Noah Bernsohn: Yeah, I agree. I do think that that idea like we’re building this custom to some degree for somebody, but oftentimes we get to places where it’s like we could build this thing that’s going to magically solve your problem that you have today with your software, but someone has to maintain this and someone has to make sure this is how you continue to do it in the future. Noah Bernsohn: So rather than building something complicated, why don’t we build something simple and have a person do this until we decide it’s a problem. Noah Bernsohn: And so that’s something that I think we say time and again. It’s like there are problems that we can solve with software and problems that should probably be solved by people until you can really, really know that this is your process for doing things all the time, and now we can offload that. Peter Compernolle: And for ecommerce, in particular, I would also advise to make sure your client understands that this is a living thing, and even if it’s completely functional and working perfectly on its delivery date, in a year, the whole world is going to be a little bit different with software changes. Peter Compernolle: So it’s important to make sure that relationship stays good and things are maintained and not neglected. Lea Alcantara: Wow! We covered a lot of topics and items here, but before we finish up, we’ve got our Rapid Fire Ten Questions. Lea Alcantara: So our listeners can get to you both a bit better. We’ll ask you both the same questions, but to have some organization, we’re going to start with Noah. Peter Compernolle: Early to bed, early to rise makes a man healthy, wealthy and wise. Emily Lewis: Noah, what’s one of your guilty pleasures? Noah Bernsohn: I don’t know. I read a lot, but that’s not really guilty pleasure. Wine? That’s not all that. Peter Compernolle: I know my answer. Noah Bernsohn: Oh, man. I know it too. Emily Lewis: Hurry it up. Noah Bernsohn: Also, Peter should be better than mine. Emily Lewis: All right, what’s yours, Peter? Peter Compernolle: I started a website recently professing my love for boxed wine, boxed wine is my life. Peter Compernolle: In Chicago, lots of restaurants are BYOB too, and they don’t specify what that second B is for. Peter Compernolle: Exactly, and you can have a few glasses and it doesn’t oxidize. It’s wonderful. Lea Alcantara: Okay, next question, what software could you not live without, Noah? Noah Bernsohn: Oh, what do I have here? I mean, honestly, most of my life is just lived in a web browser. Lea Alcantara: So Peter, what about you? Peter Compernolle: I realized a few years ago that what I enjoyed about building software is using Vim, the text editor. Emily Lewis: Noah, what profession other than your own would you like to try? Noah Bernsohn: Cooking. I’m an avid home chef and I don’t know if I could really deal with the stress of the whole operation, but I like high stress environment at times and I really love to cook. Emily Lewis: How about you, Peter? Peter Compernolle: I would like to be a wood craftsman and make wood furniture and things like that. Peter Compernolle: I still think I’ll do that one day, why not? Lea Alcantara: Like Ron Swanson. Lea Alcantara: So what profession would you not like to try, Noah? Noah Bernsohn: Most, I would say. Ah, I think being a teacher seems like the most stressful thing I can possibly imagine. Noah Bernsohn: I have so much respect for all my friends who teach, and it’s really, really important work, but it’s just being in school gives me anxiety, I think. Peter Compernolle: I always wanted to be a calculus teacher. Noah Bernsohn: That’s my dream job. Peter Compernolle: Different strokes, I guess. Peter Compernolle: I have a list of thousands of professions I would not enjoy, I think I can’t do. Peter Compernolle: One thing, I don’t know, there are lots of people that I work with regularly who do things that I admire and need, and as I say this, Noah, just motioned a steering wheel. I don’t want to have to drive cars, so I’ll say I don’t want to be a professional truck driver or something like that. Noah Bernsohn: Race car driver. Peter Compernolle: Race car driver, too, yeah, no thanks. Emily Lewis: All right, Noah, if you could take us to one restaurant in your town, where would we go? Noah Bernsohn: Oh, I think there’s a great food town, but I’ll go with stand by and say avec, which is on Randolph and is a great little sort of Tapas-y place with an awesome wine list and just the nicest people. Peter Compernolle: We are going to try to go there tomorrow with the folks. Noah Bernsohn: Yeah, we’re not busy. Peter Compernolle: I would say a restaurant called Dawali, which is BYOB, because that’s the only place my wife and I go to. Peter Compernolle: It’s Mediterranean. It’s reasonably cheap and you can always get a table and the hummus is the best I think I’ve ever had, so Dawali. Peter Compernolle: I have to warn you. Lea Alcantara: So Noah, if you can meet someone famous, living or dead, who would it be? Peter Compernolle: On Wednesday, because of the Cubs? Noah Bernsohn: Peter is a huge sports fan. Noah Bernsohn: Yeah, so it’s still rapid fire. Yeah, I think I would want to meet some of the Cubs. I do like, if I could, I do David Ross. He seems like a nice dude. Peter Compernolle: I’m not totally sure, but I always, in my head, imagine what happens if I met this person, would I act like an idiot or not, and the only person I can think that I would act like an idiot because I’d be so excited is Neil Young. I really want to meet Neil Young. Emily Lewis: All right, if you could have a superpower, Noah, what would it be? Noah Bernsohn: Oh man, I mean I think I’d probably go flying. It seems like just flying is super useful and fun. Emily Lewis: And you, Peter? Peter Compernolle: Oh, I don’t know, man. Peter Compernolle: I don’t know, lately I really value time and I’m frustrated with they’re only being 24 hours, so I kind of want to say I wish I didn’t need to sleep. Does that count? Lea Alcantara: So what’s your favorite band or musician, Noah? Noah Bernsohn: Oh wow, I was not prepared for this one, so Peter, you’re going first here. Peter Compernolle: Right, band or musician, that’s tough. Can I give the top five? Peter Compernolle: Right. Top five of all time would probably be unordered here, by the way, Beatles, Radiohead, Neil Young, David Bowie, and Bob Dylan. Yeah, man, that’s a good list. Peter Compernolle: That is a good list. Noah Bernsohn: Wow, you have a very solid answer for that one. Emily Lewis: He’s thought about it. Peter Compernolle: So my brother and my dad and I once a year toward the end of the year, we have a conversation of our top five for right now or for the year or something. Peter Compernolle: So this is something I think about a lot. Peter Compernolle: What about right now? Noah Bernsohn: What am I listening to right now? Peter Compernolle: What’s the best right now? Noah Bernsohn: I really like this Anderson .Paak album. I dig that a few times. Noah Bernsohn: So that’s really good. Emily Lewis: All right. Well, last question, Noah, pancakes or waffles? Noah Bernsohn: Waffles at either Publican or at Winchester. Winchester does these like misty risen waffles that you dip in your coffee, and it’s unreal. It’s like the best thing ever. Lea Alcantara: It sounded like a doughnut waffle. Noah Bernsohn: I have Belgian heritage, so I feel like I should say waffles, but I’m not really a breakfast food guy so can I say like a sandwich instead? Peter Compernolle: What about your egg pancake? Emily Lewis: Like a Monte Cristo or something. Peter Compernolle: Hold on, I have an answer here, and this is going to blow your minds. Peter Compernolle: In China, they have these things called Ji Dan Bing, and they’re like crepes sort of made from eggs with green onions and then they put these crispy long thing, and that’s like an unsweet churro. Peter Compernolle: And then wrap it up and it’s the most amazing food ever, and I’ll be eating one on Monday. Lea Alcantara: So that’s all the time we have for today. Thanks for joining the show, gentlemen. Noah Bernsohn: Thank you very much. Peter Compernolle: Yeah, thank you so much. Emily Lewis: In case our listeners want to follow up with you, where can they find you online, Noah? Noah Bernsohn: Probably the best place, you can find me on Twitter @bernsno, but One Design Company is our company, and that’s probably the best place to get in touch. Emily Lewis: Okay, and you, Peter? Peter Compernolle: If you’re remarkably good at spelling, you can go to petercompernolle.com. Peter Compernolle: Or on Twitter, I’m @thelowlypeon. Emily Lewis: Thanks again, guys. It was really great to have you on. Noah Bernsohn: Thank you so much. Lea Alcantara: CTRL+CLICK is produced by Bright Umbrella, a web services agency obsessed with happy clients. Today’s podcast would not be possible without the support of this episode’s sponsor! 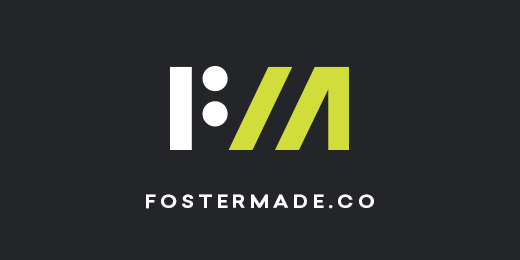 Thank you, Foster Made! Lea Alcantara: And thanks to our listeners for tuning in! If you want to know more about CTRL+CLICK, make sure you follow us on Twitter @ctrlclickcast or visit our website, ctrlclickcast.com. And if you liked this episode, please give us a review on iTunes, Stitcher or both! And if you really liked this episode, consider donating to the show, links are in our show notes and on our site. Emily Lewis: Don’t forget to tune in to our next episode which is our last of 2016 for our year in review.